The presence of pests in food processing facilities can result in the loss of raw materials and finished product from contamination, damage and consumption. It is also likely to result in failed audits, such as HACCP. Early detection and continuous monitoring are essential to minimise the risk of a pest infestation in your food processing plant. Documentation and reporting are essential to analyse and review your pest control programme. Our online reporting system, JavNet, makes it more accessible for auditors to examine, making traceability much easier should problems arise or questions be raised. At Javelin, we understand the unique challenges faced by food processing plants in Myanmar and our products and services are tailored accordingly. Pests contaminate food by damaging food packaging and by touching, eating and defecating on uncovered food, which leaves it no longer fit for human consumption. The presence of pests in your facility can result in costly audit failures, resulting in disruption to your facility’s operations, losses in revenue and even suspension of your food processing activities. Cockroaches often hide in tiny cracks and crevices and with many potential harbourage sites and easy access to food, food production lines are a prime location. Flies and other flying insects, easily enter processing plants when doors and windows are left open, particularly at night when a facility’s lights are left on, attracted to the light source. Rodents are often seen darting along interior walls and behind machinery. They gnaw through cables and can cause fire as well as spread diseases such as leptospirosis. We are fully conversant with HACCP and AIB regulations and are able to customise our treatment and monitoring programs to your internal or external audit requirements. This gives our customers piece of mind and confidence before every audit. 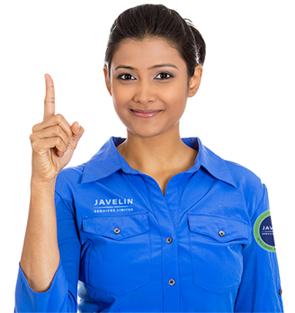 With an Intelligent Pest Control approach, your Javelin service team will identify the source of your pest problem, eliminate the conditions that allowed them to thrive, and monitor the situation for long term protection. We use a range of tailored solutions to achieve this, including hygiene and proofing advice, protective residual spraying, targeted gel and rodenticide baiting and early warning monitoring devices that help us deliver quick treatments before pests cause issues. All our treatments involve targeted applications, reducing the risk of food contamination. After a detailed inspection, a combination of IRS (Internal Residual Spraying) and IGB (Insecticidal Gel Baiting) treatment would be administered to eliminate the infestation as quickly as possible. Post treatment, monitoring devices will be deployed to monitor activity to detect any re-infestation as early as possible. Our Insect Light Traps (ILT’s) have been designed to be hygienic and to meet all legal and health and safety requirements. ILT’s use glue boards to trap and kill flies and as they are flying insect capture devices and not flying insect electrocution devices, there is no risk of beverage or raw material contamination. The deployment of anticoagulant rodenticides in secured bait boxes, where there is no risk of contamination and of snap-back traps and sticky boards, where there is risk of contamination, will safely achieve rapid reduction in rodent numbers. Rats, mice and cockroaches are often seen scuttling around waste sites and drainage systems. Living in these unsanitary areas means these pests pick up bacteria and disease, which they can then carry into your warehouses. Solutions for outside spaces, such as building perimeters, car parks and loading bays, can be both targeted and comprehensive. Our surveyors will be happy to discuss options and budgets and come up with the most appropriate solution to fit your needs. The presence of flies and other insects can be a significant problem for any processing plant, especially if flies contaminate the production line, potentially contaminating raw materials and finished products. Traditional electrified grid models (EFK’s) create unhygienic conditions by causing the fly body to explode, leaving body fragments, bacteria and pathogens on surfaces up to 6 feet away. If you are externally audited, then these traditional models could put your audit at risk. Our range of Insect Light Traps (ILT’s) have been designed to be hygienic and to meet all legal and health and safety requirements, as they use glue boards to attract and trap flies rather than an electric grill. With ILT’s, there is no risk of food contamination and tests have shown that glue-boards catch flies 100% faster than traditional EFK units. ILT’s are both silent in operation and more effective than EFK’s. Audits and audit inspections are an integral part of any food processing business. Failing an audit can be extremely costly to your business and may lead to disruptions at best and loss of business at worst. From AIB to HACCP, we can provide you with all the necessary supporting audit documentation that you need, as well as a thorough audit level pest control treatment strategy tailored to your audit requirements. Our online reporting system, JavNet, makes it more accessible for auditors to examine, making traceability much easier should problems arise or questions be raised.